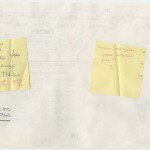 Alison Clemens is a graduate student in the School of Information at The University of Texas at Austin. 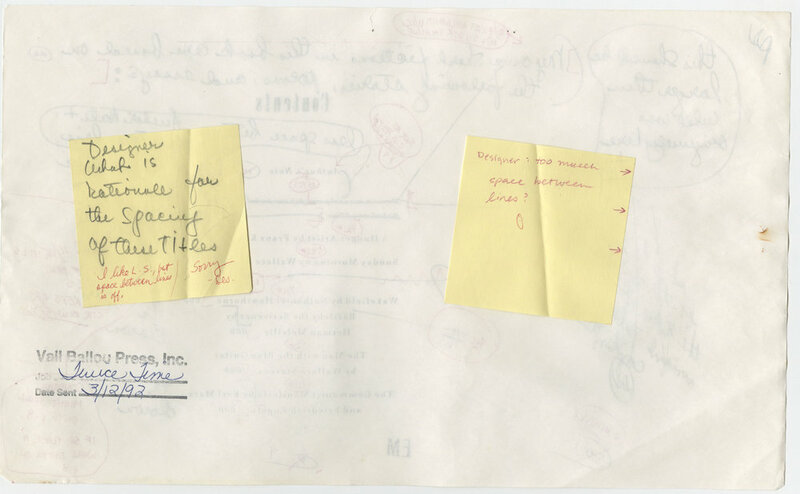 She processed the Daniel Stern papers as part of her capstone project for her program, and she shares her experiences working in the collection, which is now open for research. 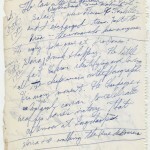 The Harry Ransom Center acquired the papers of Daniel Stern (1928–2007), novelist and short story writer, in 2009. 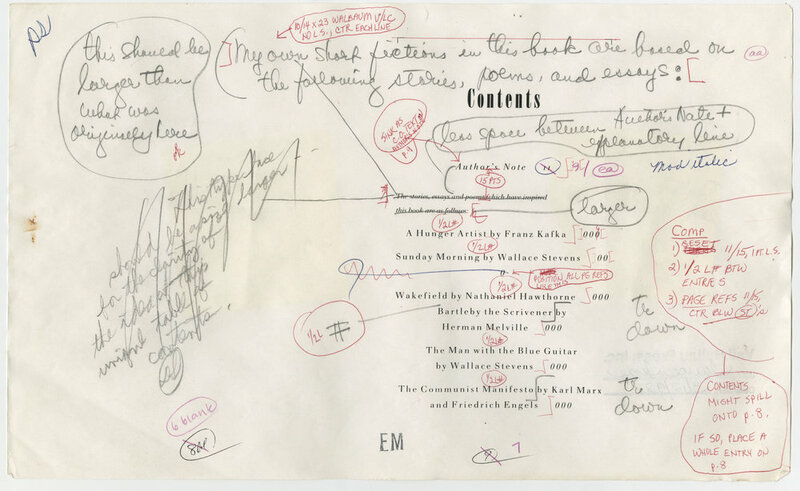 In doing so, the Center gained an illuminating piece of New York and American literary culture. 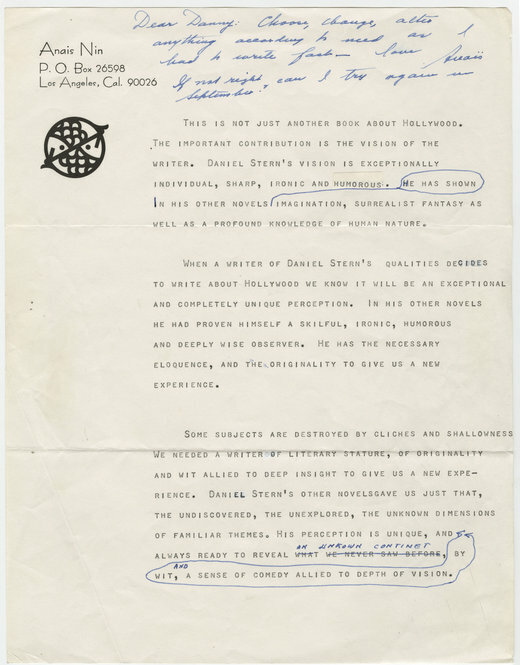 The collection is filled with Stern’s numerous manuscripts, material related to his careers in writing, advertising, media, and academia, and correspondence with major literary figures, including Bernard Malamud and Anaïs Nin. The material provides a fascinating glimpse of how Stern produced stories as a working writer. Born in New York City, Stern was raised in Manhattan’s Lower East Side and in the Bronx. He displayed considerable musical talent from an early age. He attended The High School of Art and Music and, upon graduation, played the cello with the Indianapolis Symphony and with Charlie Parker’s band. 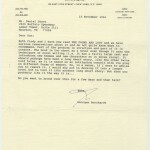 Stern disliked life in Indianapolis and returned to New York, where he took courses in creative writing and wrote jingles and copy for McCann Erickson advertising agency. Stern rose through the ranks and eventually began working in television at Warner Brothers, where he served on the board of directors in the 1970s. Throughout Stern’s corporate employment in the 1960s and 1970s, he continued to work on his writing and published numerous novels. The Suicide Academy (1968), to which Anaïs Nin dedicated an essay in her collection In Favor of the Sensitive Man, was popularly successful. In the 1970s, however, Stern would experience two major shifts. First, he left Warner Brothers and moved to the promotions department of CBS in 1979. During this time, he also began writing short stories and sending them to literary reviews, including to Joyce Carol Oates at her magazine Ontario Review. After achieving success as a short story writer, Stern left CBS in 1986 and served as humanities director of the 92nd Street Y until 1988. He assumed teaching positions, including at Harvard and Wesleyan Universities, and joined the University of Houston as Cullen Distinguished Professor of English in 1992. Stern’s short story collections—including Twice Told Tales and Twice Upon a Time—revisit, revise, and reinterpret literary classics by other authors. 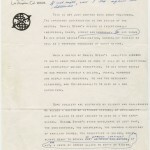 Malamud described Stern’s prose as filled with “poetry, inventiveness, verve of style, wisdom in paradox, the argument, [and] wit and comedy.” Stern’s creative process and output is well documented in the papers at the Ransom Center, as the collection contains drafts, correspondence pertaining to specific works, and even unpublished material. 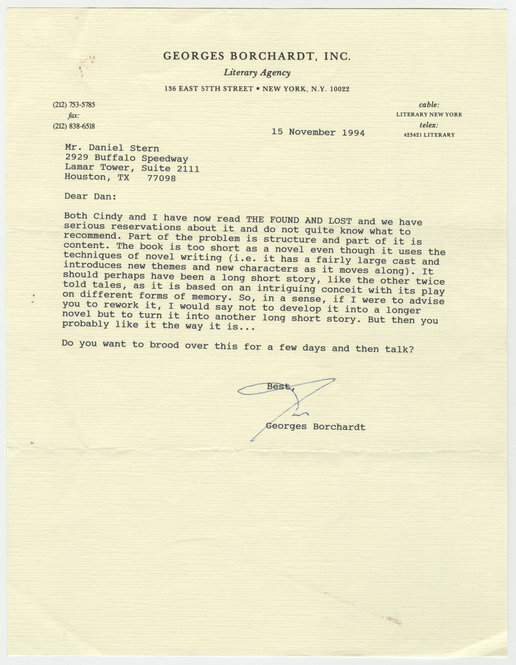 This letter from Stern’s literary agent, Georges Borchardt, shows how Borchardt served as both an agent of Stern’s interest and a critical force in his creative work. Copyright © Georges Borchardt. Used by permission. All rights reserved. 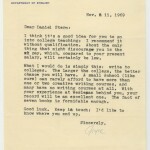 In this letter, Joyce Carol Oates advises Stern on strategies to leave media and advertising work and begin his professorial career. Stern and Oates began and maintained an amiable, professional relationship, and when he began writing short stories in the 1970s, he sent his work to her for publication in her Ontario Review. Anaïs Nin was a consistent supporter of Stern and his work. 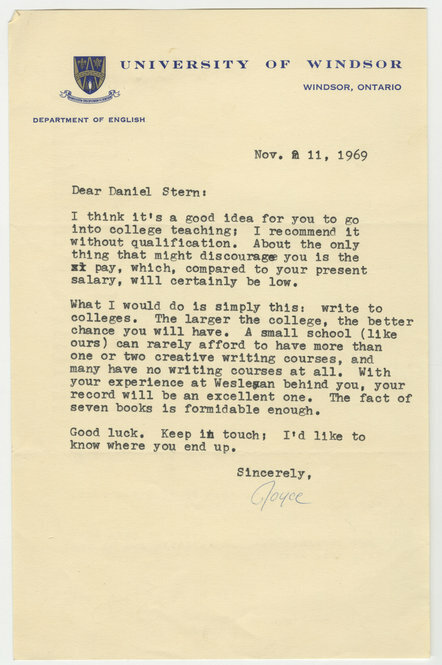 She wrote this letter to provide Stern with promotional material for his books, and her manuscript note at the top of the page implores him to use her supplied praise however he sees fit. 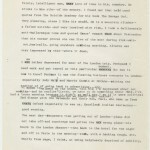 These pages from Stern’s journals are typical of his manuscript and typed recordings of and reflections on his daily activities. 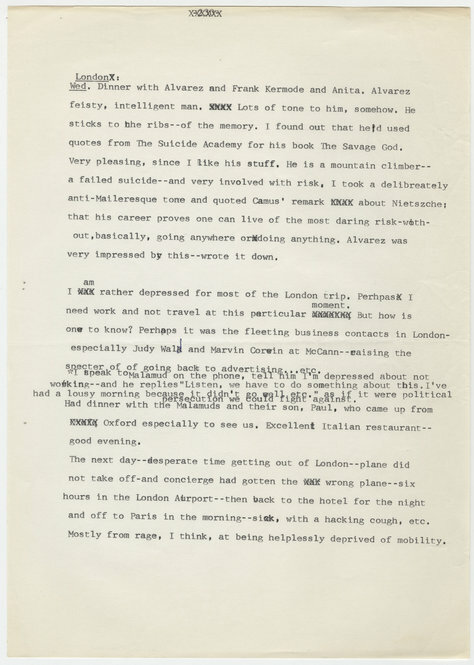 Stern’s journals often document his interactions with literary figures, such as, in this case, Jean-Paul Sartre, Al Alvarez, and Frank Kermode. 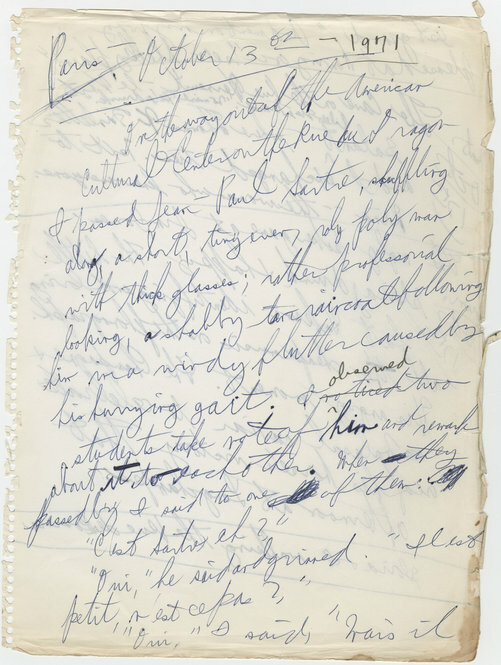 Such journal entries are of especial interest because Stern’s later short stories, including those published in “Twice Told Tales” and “Twice Upon a Time,” reinterpret literary history and classic works. Copyright © Estate of Daniel Stern. Used by permission. All rights reserved. Copyright © Estate of Daniel Stern. Used by permission. All rights reserved. 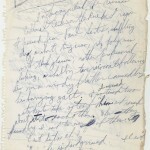 Page from Stern’s journal. Copyright © Estate of Daniel Stern. Used by permission. All rights reserved. These page proofs from 1989’s “Twice Upon a Time show” how Stern’s short stories were compiled, proofed, and published in book format. 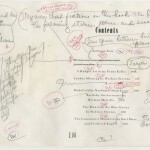 The listing of story titles on the table of contents is typical of Stern’s short stories; he reimagines class fictional tales, leaving their original titles, along with the name of their authors, in place.Copyright © Estate of Daniel Stern. Used by permission. All rights reserved. These page proofs from 1989’s “Twice Upon a Time “show how Stern’s short stories were compiled, proofed, and published in book format. 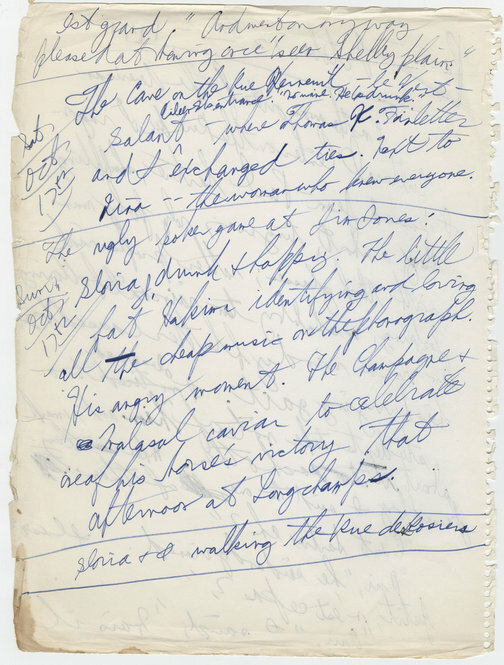 The listing of story titles on the table of contents is typical of Stern’s short stories; he reimagines class fictional tales, leaving their original titles, along with the name of their authors, in place. Copyright © Estate of Daniel Stern. Used by permission. All rights reserved. Page proofs from 1989’s “Twice Upon a Time.” Copyright © Estate of Daniel Stern. Used by permission. All rights reserved.